It has received the “Outstanding Construction Award for Historical Renovation” from the Associated General Contractors of Texas. The silos project “is a perfect example of a historical building being preserved and updated simultaneously, new use for an outdated facility,” K. Paul Holt, president of the local office of the Associated General Contractors of America​, said. 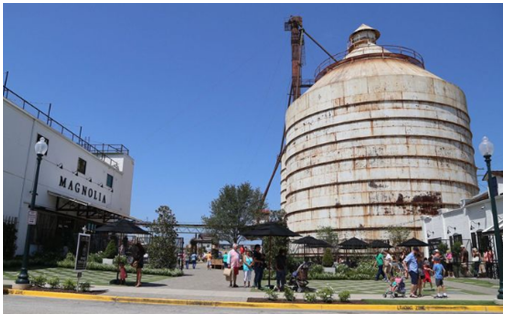 The Silos complex is inspired by the “Fixer Upper” television show on HGTV starring Magnolia Market proprietors Chip and Joanna Gaines. It attracts 20,000 to 30,000 visitors a week from across the United States. Want more Texas retail information? Check out Dallas Retail Market Research and Houston Retail Market Research​.